The 1986 British Fields medallist knighted in 2012 for his contributions to mathematics, Simon Donaldson, opens the second day of the International Congress of Mathematicians with an overview of how two different areas of differential geometry can overlap for astonishing, new results. Hundreds of eager mathematicians shuffle into the main Plenary Hall at half past eight in the morning to hear him speak. A Professor in Pure Mathematics at Imperial College London, Donaldson looks at manifolds in topological space and explores existence questions – in other words, whether smooth and complex structures are mathematically solvable. Before he begins, he pays homage to one of Brazil’s best mathematicians, Manfredo do Carmo, an emeritus professor at the Institute of Pure and Applied Mathematics (IMPA) who passed away in April this year, at the ripe age of 89. “It is particularly appropriate to talk about this in Brazil,” said Donaldson in his calm demeanor, pacing slowly across the stage, “given the development of differential geometry in Brazil over the past 60 years. 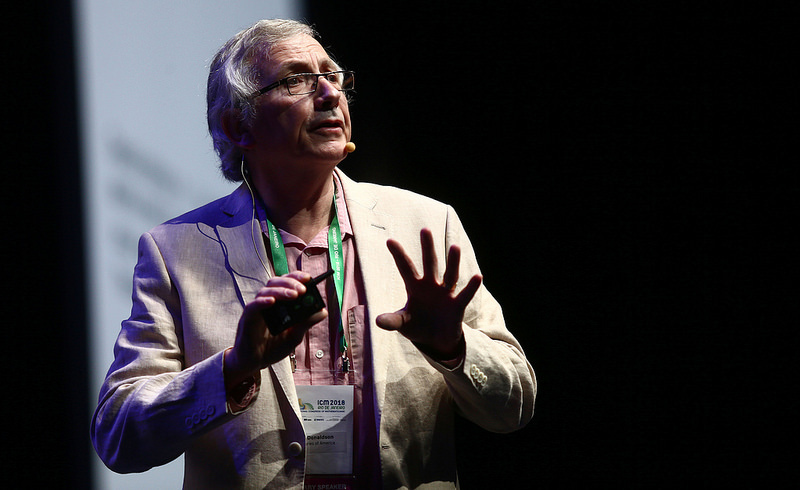 We remember, especially, the huge contribution of Manfredo do Carmo both in his development in Brazil and differential geometry in the world more generally.” Now in its 12th decade, the ICM is being hosted for the first time in the Southern Hemisphere. Rio de Janeiro is a global hub for mathematical research, a significant feat that is often overshadowed by the city’s other claims to fame. Through his lecture, he demonstrates with examples of how connections between different areas have rendered significant progress in the field. The range is broad, in one example, he explores Kähler metrics. In another, he enters the 7th dimension manifold to explore existence questions of exceptional holonomies.